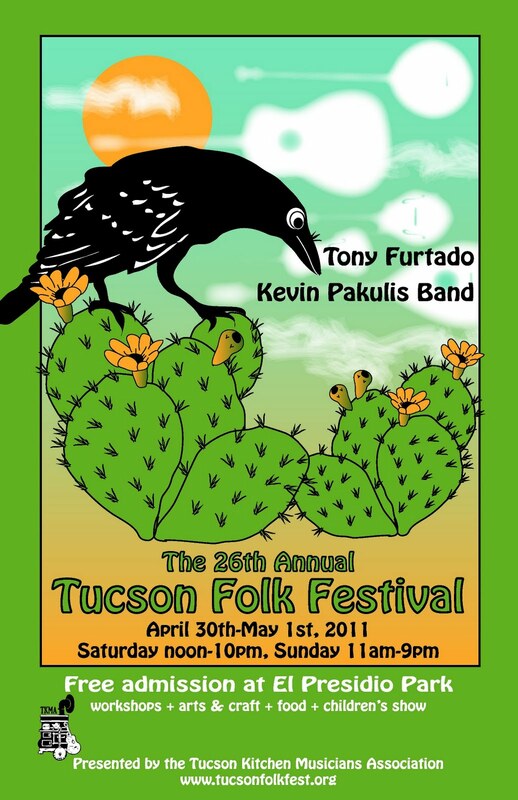 The Tucson Kitchen Musicians Association proudly invites all music lovers to enjoy two days of live music on four stages in and around El Presidio Park and the Tucson Museum of Art on Saturday April 30th and Sunday May 1st, 2011. KXCI will be broadcasting the festivities from the Plaza Stage on an approximate one hour tape delay beginning around one-ish on Saturday and noon-ish on Sunday until the cows come home. Come on down to the Folk Festival when you can, but tune in to 91.3 when you can't be there. Or stream from anywhere in the world at kxci.org. Halftime at the Apocalypse host Jeff Rogers and Amanda will kick off the first three hours of the broadcast on Saturday. Then veterans Ruby and Mike Landwehr will show us how it is done for the rest of the day. Your Morning Brew host Jim Blackwood and The Home Stretch Host Jason Repko will join forces to cover the first three hours of Sunday's broadcast. Old friends Ruby and Mike Landwehr will anchor the rest of the weekend. 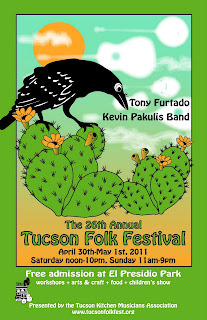 KXCI's broadcast of the 26th Annual Tucson Folk Festival will include an encore performance by 2010 headliner John Coinman followed by headliner Tony Furtado on Saturday night. On Sunday, our broadcast of the Folk Festival will conclude after Greg Morton's performance airs on KXCI. Through the generous support of numerous sponsors and the hard work of more than 100 TKMA volunteers, this family-friendly event remains completely free to the public as it has been since it began in 1986.